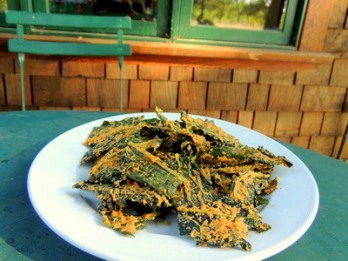 Who knew that kale chips could taste better than corn chips, tortilla chips, maybe even potato chips! Here are two recipes for these amazing chips that are every bit as flavorful as the other chips we grew up with. These are perfect for weight loss plans. How is it possible that kale can not only be crunchy and crisp but have a cheese flavor and taste, well sort of like fat? They are satisfying in the way that "real" chips are because they are made with fats - plant fats, which are, ahem, unsaturated omega 3 fatty acids. One of my readers who lives nearby brought these chips to me one day. I couldn't believe they weren't made with cheese. Place all the ingredients except the kale into a blender and blend until smooth. Wash and dry the kale thoroughly in a salad spinner and then blot with a kitchen towel. Put everything into a large bowl to mix. Use your hands to mix the coating thoroughly into the kale leaves so all are covered. Place them on a cookie sheet that's non stick and leave them in your oven set at 150 degrees over night. You may need to take the crispy ones out in the morning and leave any moist ones in the oven for another hour. If you have a dehydrator you can also put them in a dehydrator to crisp them up. The flavor of these is cheddar cheese! I asked two people what they thought was in the recipe and they both said cheddar cheese! They are delicious and just spicy enough that they satisfy the desire for something salty and crisp. Preheat oven to 300 degrees. Rinse kale and thoroughly blot dry with a kitchen towel. Tear leaves from the ribs and discard the ribs. Tear the leaves into 4 inch pieces. Pour oil and soy sauce into a large bowl, add kale, toss to coat evenly. Arrange the leaves in a single layer on two rimmed baking sheets. Bake, switching the pan positions after 13 minutes. Sprinkle with sesame seeds and bake until leaves are crisp but not browned, 5 - 7 minutes more. This recipe comes from Sunset magazine. This one is also really yummy, more savory than cheesy. Kale is one of the more nutritious greens you can eat. How nutritious? When your body gets enough phytonutrients, it begins to crave the healthy foods and the sugar cravings go away. If you juiced or cooked kale every day I'm sure that you would not have to worry about getting sick or fat ever. Kale, let me count the ways it's good for you. Kale is in the brassica family of vegetables which do more for your natural immunity than any other vegetable. Kale and spinach have the most antioxidants of all. Kale is an exceptional source of chlorophyll, calcium, iron and vitamin A. Think of all the other chips (deep fried) you could be eating: potato (no good,) tortilla (ditto,) high glycemic and loaded with transfats. Then there are all the more exotic, baked versions, a little better but still salty, high glycemic, all impossible to stop eating once you've started! Cooking foods at high temperatures, especially when they are deep fried in oil as these chips, can produce large numbers of free radicals. Fried foods lead to inflammation and are loaded with calories. When you start eating more cleanly, (foods that nourish,) you discover that indulging in the deep fried, salty stuff will make you feel slightly nauseous and it throws off your alkaline, blood chemistry you've worked so hard to achieve. I'm always on the look out for some good, low glycemic snacks that are tasty, healthy and won't cause havoc with your blood sugar. Salty foods are just as disruptive to your metabolic balance as sugary ones. A teeny bit of salt goes a long way. These kale chips are the perfect solution when you need some healthy munchies! Return from Kale Chips to Low Glycemic Recipes. Return from Kale Chips to Lifetime Fat Loss home page.